Hey guys..R u a karan johar or a yash chopra fan..they u have landed into the correct place...this club is dedicated only and only to Karan Johar and Yash Chopra fans! Karan Johar (born May 25, 1972 in India) is a son of the late Yash Johar and a popular Indian film director, producer, and TV celebrity. Karan studied at the Greenlawns High School and attended H.R.College in Mumbai, India. Karan has also received a Masters degree in French. Dharma Productions, founded by his father, is his production company. Karan Johar was first seen as an actor: he played Shahrukh Khan's close friend, Rocky, in the movie Dilwale Dulhaniya Le Jayenge (1995). He was also assistant director on this film and helped Aditya Chopra in writing the screenplay. In addition, he selected Shahrukh Khan's costumes, something he continued to do for Shahrukh Khan's other movies like Dil To Pagal Hai (1997), Duplicate (1998), Mohabbatein (2000), Main Hoon Na and Veer-Zaara (2004). He made his directorial debut in 1998 with Kuch Kuch Hota Hai, which roughly translates to Something Something Happens. The film was a major box office hit. Kuch Kuch Hota Hai won eight Filmfare Awards in 1998 including Best Movie, Best Director and all four Best Actor awards for both leading and supporting roles. The film, commonly abbreviated KKHH, starred Shahrukh Khan, Kajol, Rani Mukerji, Salman Khan and Anupam Kher. His second directorial effort, the multi-starrer family drama Kabhi Khushi Kabhie Gham, which roughly translates to Sometimes Happiness Sometimes Sadness, was released in 2001. It was also highly successful. K3G, as the film is commonly abbreviated, went on to win five Filmfare Awards. In 2003, he produced and wrote the script for Kal Ho Naa Ho, which was directed by Nikhil Advani, his assistant director from Kuch Kuch Hota Hai. Kal Ho Naa Ho, which roughly translates to Tomorrow May Never Come, starred Jaya Bachchan, Shahrukh Khan, Saif Ali Khan and Preity Zinta. It too was a hit. In early 2005, he produced another movie, Kaal, directed by Soham Shah, Johar's assistant director from Kabhi Khushi Kabhie Gham. Johar did not write the script to Kaal. In September 2005, after taking a four-year break from directing, he began working on his third film as a director and fourth film as writer, Kabhi Alvida Naa Kehna, which roughly translates to Never Say Goodbye. It stars Amitabh Bachchan, Shahrukh Khan, Rani Mukerji, Preity Zinta, Abhishek Bachchan, Kiron Kher and Arjun Rampal. KANK, as the film is commonly abbreviated, released on August 11, 2006. 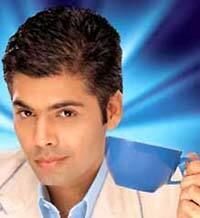 Johar has also hosted a television chat show called Koffee with Karan commissioned by Star World, in which he interviewed renowned celebrities from Bollywood and India's glamor world. Johar describes his show as being "casual, cooler and hipper" and aiming to appeal to Indian yuppiedom. With the first season of the show ending in 2005, Karan will begin the second season in the second half of 2006. The second season is also said to include interviews with prominent industrialists. He was the host for the 2006 Zee Cine Awards on March 4th in Mauritius. Karan Johar's movies, generally classified as emotional melodramas, find a wide appeal among audiences in India and abroad. His movies tend to glorify the traditions and values of Indian people, and focus on the urban sections of India in particular. Inspired by Yash Chopra's style of filmmaking, almost all of Johar's films rank high in the "feel good" and "glamorous realism" factor. Karan Johar movies consistently celebrate material luxuries and are characterized by elaborate sets, exquisite costumes and picturesque songs. All movies written by Karan Johar (Kuch Kuch Hota Hai, Kabhi Khushi Kabhie Gham, Kal Ho Naa Ho and Kabhi Alvida Naa Kehna), start with 'K' and consist of four words. It is said that this is done for luck; many Bollywood celebrities put some credence in numerology. On September, 30th, 2006 Karan Johar became the first Indian filmmaker to be a jury member in the Miss World final in Warsaw, Poland. 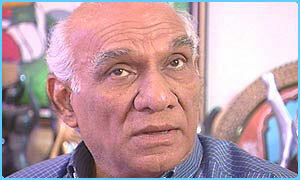 Yash Chopra (* 27 September 1932) is a writer, director and producer of Bollywood movies. He has directed hit movies such as Deewar, Lamhe, Yeh Dillagi , Darr, Dil To Pagal Hai and Veer-Zaara. Yash Chopra was born in Lahore, now in Pakistan, during British Raj. He was the youngest of the eight children fathered by Shri Vilayati Raj Chopra. His brother Baldev Raj Chopra was a film journalist, who later began directing movies. Initially Yash worked as an assistant to I. S. Johar; then he worked for his brother. Later he setup his film production company Yash Raj Films. Baldev gave him his first directorial opportunity in Dhool Ka Phool. Daag in 1971 was Yash's first film under the Yash Raj banner. Yash Chopra's son Aditya Chopra is also a film director. A second son, Uday Chopra, is an actor. Pamela Chopra is his wife. Yash Chopra was honoured along with the Egyptian comedy superstar Adel Imam and the Oscar Winning actor Morgan Freeman as the Asian, Arab and Hollywood honorees in the Dubai Film Festival "In the Spotlight", which honors the work of eminent actors, producers and directors from around the world for their distinguished service to the film industry. So guys..join now...we will have loads of stuff..like siggy contests,games,avi contests,and loads more..!!! I am of cource in.Love their work!! thanx..!I will make a members list soon! hey diya..grt job dear..i'll join....im a big fan of karan johar since all his movies reallie touchers my soft corner!!! !Esp KANK......and not forgetting Mr Yash!!!! Both of the directors had made me fall in love wif SRK all over again.....I'll be joining da club!!!! Does Kjo pay them or they pay Kjo ?